The previous batch of moss-on-rocks matured and were transferred out, so i had to fill this tank with other plants. 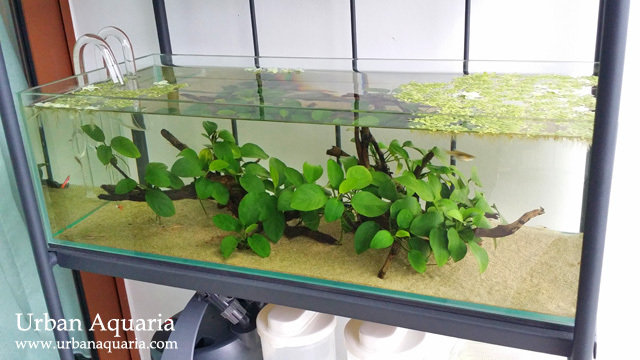 Decided to do a very simple low maintenance layout and just tie anubias plants to branchy wood pieces. Its been running for almost 2 months now and the anubias plants seem to be doing okay. The bunches sprout visible new leaves every few days so it's slowly growing in density. Current tank residents comprise of 40+ cherry shrimps, 2 horned nerite snails, 2 otocinclus and 5 chili endlers, along with dozens of tiny endler fry. Still no additional fertilizer dosing, just the usual 30% water change every week and feeding the tank inhabitants some micro pellets and mini algae wafers regularly. I'm guessing the tank isn't getting as much indirect sunlight nowadays (its currently been raining during most afternoons) which probably explains the relatively algae-free tank glass and plant leaves at the moment. Maybe the floating plants are also soaking up most of the excess nutrients too, so that may be helping to keep nutrient levels under control (i usually have to remove handfuls of them every week during water change). 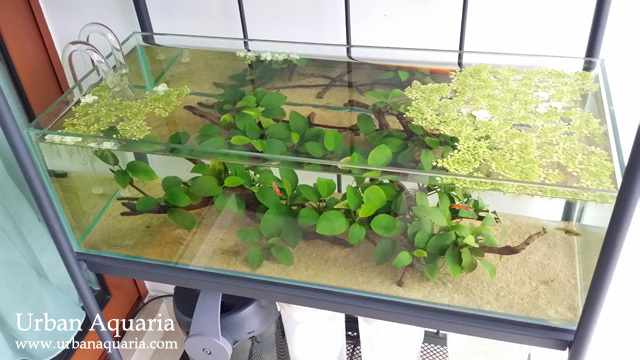 I enjoy looking at your various tank setup. I would like to know if you do customization aquarium setup for shrimp tank. Thank you. Amazing blog! I really love designs of your tanks, minimalistic, clean, bright. I didn't find any others blogs with designs such as yours. Love it! I'm looking for new articles! Happy New Year! Just want to check with you, did you do any tank cycling when you introduced your shrimps into this tank? In this case, i was already using a canister filter with cycled bio-media inside, so the tank is already cycled when i introduced the livestock. That being said, a brand new tank setup with inert substrate like sand and new filter would still go through the cycling process. For such setups, most keepers would usually introduce livestock in small numbers and in stages over the course of many weeks, so that each batch of livestock would produce just enough ammonia for the beneficial bacteria to grow and develop. The key is slow and steady increase in bio-load so that the beneficial bacteria have time to grow and handle the cycle at each stage. Hi UA, love your set ups. May I know where you get your stand from? Thanks! The outdoor stand was from IKEA, its called the LÄCKÖ series shelving unit.